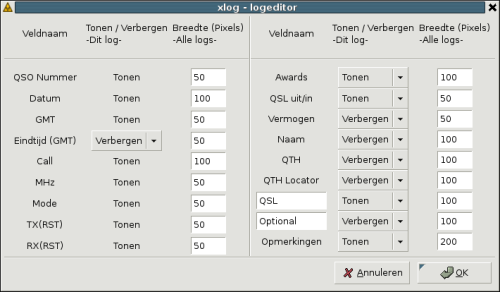 Xlog, a logging program for Amateur Radio Operators. Xlog will display a log with the most recent contacts added to the top. You can add, delete and edit log entries. The log is saved into a text file. You can open, close and create logs as you need them. Xlog supports cabrillo, ADIF, trlog (format also used by tlf), and EDI (ARRL VHF/UHF contest format) and can import twlog, editest and OH1AA logbook files. 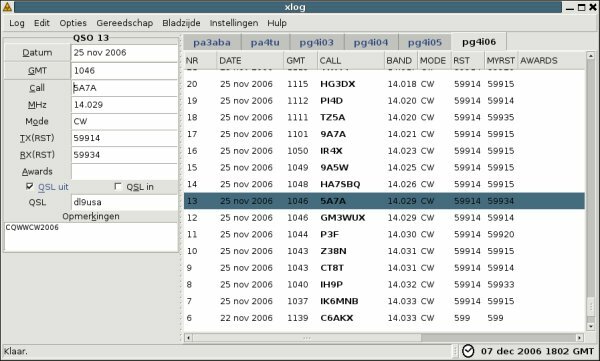 QSO's can be entered with any date, because xlog can sort your log chronologically, provided you use the correct date format (see the MANUAL). Xlog screenshot with some of my latest QSO's. See the screenshot section for user contributed xlog screenshots. 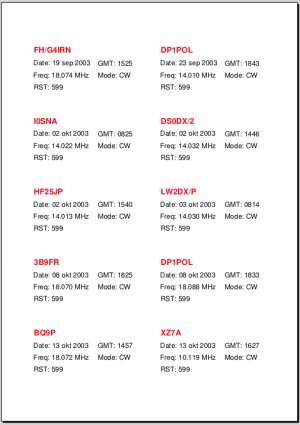 Xlog is able to do DXCC lookups and will display country information, CQ and ITU zone, location in latitude and longitude and distance and heading in kilometers or miles, both for short and long path. Locator distance and heading calculation for VHF logging is also supported if you enable the 'QTH Locator' field in the log with the log-editor (see below). Xlog adds a scoring window, where your DXCC score is being kept for the most important shortwave bands. You can also add scoring for the most important awards, like WAS, WAZ and WAC. For people who like to keep track of locator scoring a world map has been added. If your rig supports data retrieval over the serial line, you should have a look at the Hamradio Control Libraries (hamlib) project page. Xlog can read your rig's frequency, mode and signal strength and power. You will get 2 dockable widgets on the statusbar. At any given time, you can fire up the log-editor, to disable or enable fields in the log. The log-editor will also appear after creating a new log from the menu. Changes will be committed to the log after you have saved it. There are several programs which can exchange logging data with xlog: gmfsk, marote, ktrack, twpsk, gpsk31, and kpsk. Printing is done using the GTK+ library. Select log --> print from the menu. This will activate the print dialog. You have 2 different styles to choose from, landscape and portrait. 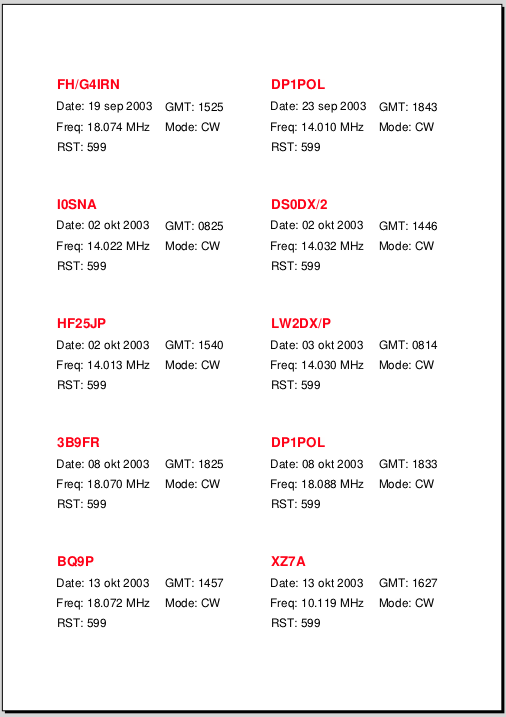 Landscape prints 30 QSO's on a page and portrait will print 50. You must make sure the log will fit on the paper, by selecting the correct font and columns to print. 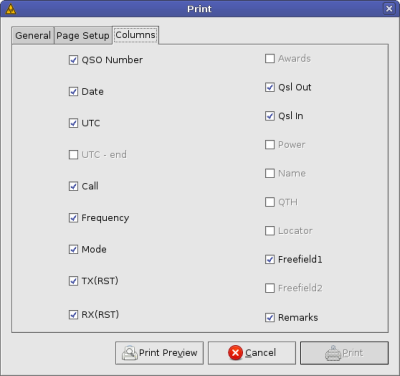 Landscape is most suited for printing normal logs. A new option added is printing of QSL labels. When you 'Save As' a 'TSV' (Tab Separated VAlue) file from the menu, you can import this file into glabels, using the provided template in the xlog data directory. 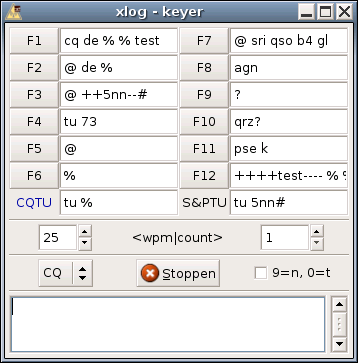 Xlog also adds a keyerwindow, opened from the 'Tools -> Keyer' menu. This is a simple interface to cwdaemon and will allow you to run a contest. It features programmable function keys, macro's, switch between CQ and S&P mode, an auto increment counter and short numbers. Xlog is written with the GTK+-2.0 library. Current version is 2.0.17. You can have a look at the latest changelog if you are interested. Get the source here. You will need Hamlib and at least gtk+ version 2.18.0 development libraries and headers to compile xlog. Xlog has a project page at savannah, to coordinate xlog development. A mailing list has been set up for discussion on future xlog versions.